In Children of Morta, I did not save a puppy. My family will never live it down. 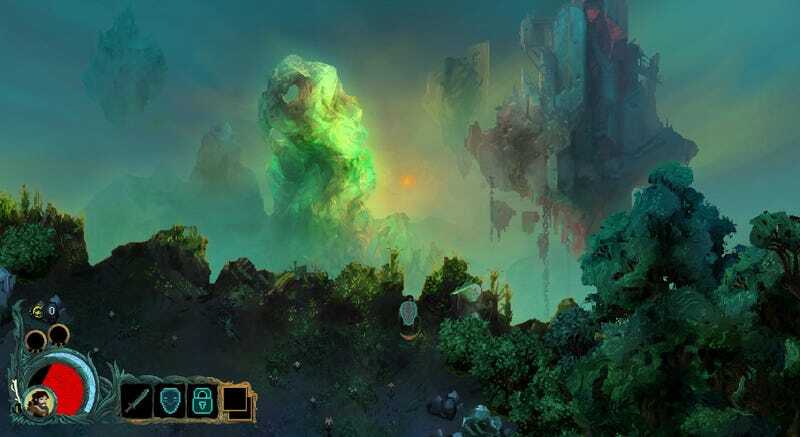 Children of Morta is a hack-and-slash game for PCs and consoles currently in development by indie studio Dead Mage and published by 11-bit, the folks behind This War of Mine. It focuses on the Bergsons, a family of pixelated adventures who guard a magical mountain that’s been overrun with monsters. The game has procedurally generated dungeons, characters with different abilities, and collecting loot to improve your stats. It’s standard fare, but with a couple cool twists. The first twist is the conceit itself. Instead of controlling a group of adventurers, the player controls a family, whose home base is their palatial-but-quaint ancestral house. Each family member has a different skill set. Only two were available in the demo I played: patriarch John, a close combat fighter; and youngest child Lucy, who the game tells me learned to throw fireballs from her grandma Margaret. (My grandma tried to teach me to play bridge, but I was never very good.) Family members take turns descending into some caves through an apparently unremarkable stargate in their basement, fighting their way through the hordes of foes while collecting gold, souls, and runes, as well as leveling up. These levels and goods persist when a character dies, including an item called an ancient core that can be used to unlock new parts of the house. I’ve unlocked the training grounds, cleverly located in the house’s side yard, which allows me to spend gold to improve the family’s health, damage, and XP. The Bergsons really feel like a family, instead of a plot contrivance draped over different classes to explain why they’re together. In between runs, you get cutscene snippets of the family’s non-combat life. If you manage to save the imperiled puppy you’ll get a cutscene of the family gathered around it, nursing it back to health. (I looked it up on YouTube because puppy.) Grandma Margaret tells stories to the family while they gather around her creaking chair. A pregnant mother feeds wild animals in the forest. The narration in these scenes is sometimes a bit overwrought, but their brevity and contrast from the game’s bloody combat makes them moving. Though I’ve only played two of the characters, I already have a sense of the relationships and bonds between family members. I’m excited to see what else this adds to the game outside of hacking monsters to death. The combat itself feels a bit spammy, with sheer numbers standing in for complexity, but John and Lucy play differently enough that things still feel tactical. Lucy doesn’t have much health and can’t move while casting fireballs, but she’s nimble otherwise and good for keeping mobs at bay. John is heartier and has a shield, but he has to get up close to do any damage. In addition to the changing layout, each run is also affected by runes you’ll find that alter your abilities and which you lose upon death. On one run, John’s shield stunned enemies; on another, Lucy’s fireballs set enemies permanently on fire. You can also find weapons with special abilities, though I’ve rarely stumbled upon them in the changing tangle of caves. All of this is enough to give each run some variety, even if the combat itself sometimes feels rote. The handwriting-looking font is a really nice touch. The second way Children of Morta stands out is in its art style. The pixel art characters have detailed animations, but the settings and backgrounds really shine. The tutorial level is a lush mountain forest, with creepy foliage, elegant ruins, and strange floating islands. It’s utterly gorgeous and evocative, even if you’ll be too busy fighting monsters to quite take it all in. Splashes of light, intricate patterns carved into floors and boxes, and subtle details like a fish jumping in a pond give the world character and presence. Particular attention is lavished on the Bergson home, with rugs, fish tanks, and crackling fireplaces making it feel lived in. The house is a fancied-up menu screen at heart, but it feels like a real place I’m excited to spend more time in, and a welcome respite from dungeon-crawling. I mean, look at this. Damn. Despite being initially unimpressed with the combat—the thing you’ll spend most of your time doing—I found myself at 1am with my controller in hand, swearing to myself myself “just one more run.” I haven’t gotten further than the second level of the caves, but I’ve found some mysterious items that have me eager to know what else is down there. Children of Morta turns somewhat predictable building blocks into a game with a unique charm—plus I really want to know if I can save another puppy. Children of Morta aims to be out this year, though I’m told there’s no set release date yet.